How To Setup VirtualHosts, Multiple Websites in XAMPP Apache Server? 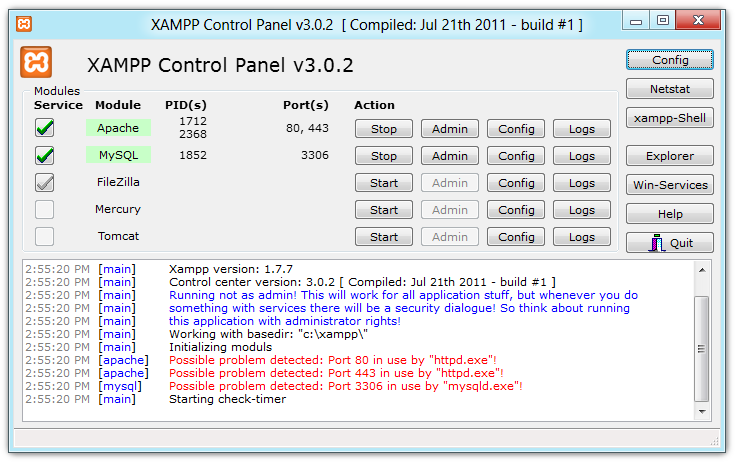 XAMPP provides a full blown Linux Apache MySQL server installation and is a very good way to seup LAMP architecture on your Windows PCs. Although, XAMPP is available for Linux distribution as well, but is not used often as LAMP packages are readily available on Linux distributions. In this article we will talk about how to set-up Multiple Websites in XAMPP or any Apache Server. "Multiple Websites" would be the common term for the much appropriate technical term - "VirtualHosts" or "NameVirtualHosts". This file is your VirtualHosts configuration file and will be referred to in all forthcoming steps. Step 3 - Add the first VirtualHost directive for your localhost so that urls like http://localhost or http://127.0.0.1 are still accessible. This is an extremely necessary step and make sure you add this to the VirtualHosts configuration file else you will lose access to the http://localhost.